for RealAudio comments by the composer, 6:14. 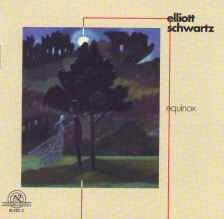 Elliott Schwartz (born 1936, New York City) studied composition with Otto Luening and Jack Beeson at Columbia University (AB 1957, MA T58, Ed.D T62). He is the Robert K. Beckwith Professor of Music at Bowdoin College, where he has taught since 1964, including twelve years as department chair; from 1988 to 1992 he also held a half-time Professorship of Composition at The Ohio State University School of Music. Visiting appointments have included Trinity College of Music, London (1967), the University of California/Santa Barbara (College of Creative Studies, 1970, T73,U74), the University of California/San Diego (Center for Music Experiment, 1978-79), and Distinguished University Visiting Professorship at The Ohio State University (1985-86). He spent the fall 1993 term at Cambridge University (UK). as holder of a visiting Bye Fellowship at Robinson College, and is scheduled to hold a similar visiting fellowship at Cambridge for the spring 1999 term. He has served as President of the College Music Society, National Chair of the American Society of University Composers (now renamed the Society of Composers, Inc.), Vice-President of the American Music Center, President of the Maine Composers Forum, and music panelist for the Maine Arts Council. 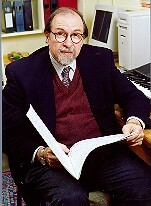 He is presently a board member of the American Composers Alliance. 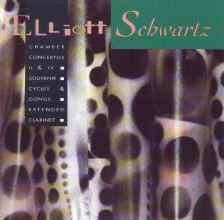 Elliott Schwartz is co-editor of the anthology Contemporary Composers on Contemporary Music, co-author of Music Since 1945, and the author of Electronic Music: A Listener's Guide; The Symphonies of Ralph Vaughan Williams and Music: Ways of Listening. He has also written essays and reviews for Perspectives of New Music, The Musical Quarterly, Musical America, Music and Musicians (England), Nordic Sounds (Denmark) and other publications. His compositions are published by Margun Music, MMB-Norruth, Merion (Theodore Presser), Pembroke (Carl Fischer), Tetra /Alexander Broude, Fallen Leaf Press, and ACA. A number of his works are on Folkways, Advance, Orion, Arista and Opus One long-play records. There are also compact disc recordings of his music on the CRI, Vienna Modern Masters, Capstone, GM, Innova and Organic Oboe labels. Performances of his music include the Minnesota Orchestra, Indianapolis Symphony, Cincinnati Symphony, Milwaukee Symphony, Saint Paul Chamber Orchestra, Contemporary Chamber Ensemble, ALEA III (Boston), Pittsburgh New Music Ensemble, New York Chamber Soloists, Atlanta Virtuosi, Tremont Quartet, Esbjerg Ensemble (Denmark), Lontano (UK), and Spectrum (UK). Major festivals and new music series include the Monday Evening Concerts (Los Angeles), "Music of the Americas" series (London), Berkshire Festival (Tanglewood), "Music in Our Time" (New York), De Ijsbreker (Amsterdam, Netherlands), the York and Bath Festivals (Britain), and European Music Week (UNESCO Centre, Paris). Honors and awards include a Dutch Gaudeamus Prize, two Rockefeller Foundation residencies at Bellagio, Italy, three grants from the National Endowment for the Arts, an NEA Consortium commission, and a McKim Fund commission from the Library of Congress. 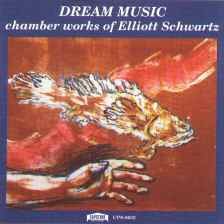 Schwartz's guest appearances include Oxford University, the Royal College of Music and Trinity College of Music (UK), the Royal Danish Academies at Aarhus and Copenhagen, Hochschule fur Musik (Cologne and Mannheim/ Heidelberg), LUEcole National du Musique (Saint Germain-en-Laye, France), Institute for Advanced Musical Studies (Montreux, Switzerland), New York University, the Schoenberg Institute of the University of Southern California, Atelier Musique de Ville dUAvray (France), and the University of California (Berkeley, San Diego, Irvine and Santa Barbara campuses). He has presented four radio programs of American music for the British Broadcasting Corporation, and also been the subject of a 60-minute National Public Radio "Options" program. There have also been extended residencies as featured guest composer at Northwestern University, the University of Oregon, University of Louisville, Pennsylvania State University, University of Kansas Symposium, Cornell University Festival, Louisiana State University Festival, Memphis State University Festival, and the Washington State University Festival. In recent years (since 1990) his appearances as visiting composer/lecturer have included London, Boston, Amsterdam, Washington, D.C. and Los Angeles, residencies at Bennington College, the University of Arizona and the University of Montana, the University of New Mexico Festival, Greenwich House, New York (all-Schwartz program), North-South Consonance Series (New York), Museum of Modern Art Summergarden series (New York), Hochschule fur Musik Mannheim-Heidelburg (Germany, all-Schwartz program), the Musikinstitut of the University of Copenhagen (Denmark), and the RLeningrad SpringS Festival (Russia). Recent premieres include De Ijskbreker (Amsterdam, Netherlands), the New Hampshire Music Festival, Portland Symphony Orchestra, Alliance Francaise (New York), the University of Minnesota Symphonic Wind Ensemble, the Tivoli Trio of Denmark, the Donnell Library (New York), the International Double Reed festival (Rotterdam) the European Youth Orchestra Festival (Copenhagen), and the Pablo Casals Festival [France). Current composing projects include a saxophone concerto for the New England Conservatory Orchestra. In 1997-98 he will appear as featured composer at the "Music Past and Present" series (London), the Weimar (Germany) Hochschule, and the Netherlands National Youth Orchestra. He will also return to Cambridge University (UK) as 1999 resident Fellow for the Easter Term, and appear at the University of Miami (FL) as guest composer for the 1999 Miami Festival.